The Spring meeting and AGM ran to time despite the microphone playing up and the business part of the meeting was swiftly dealt with. 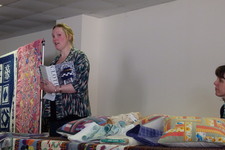 Our morning speaker Sian Cornish – told us how she came to set up her Cornwall based outlet for organic fabrics sourced from around the world following her concerns about conventional cotton production which uses hazardous chemicals sprayed on the cotton crops which is damaging both to the environment and to the people who produce it. She recently discovered that her grandfather was a cloth merchant for part of his life in Lancashire in the 1950’s, selling worsted suiting fabrics from his pillar at the Manchester Free Trade Hall. 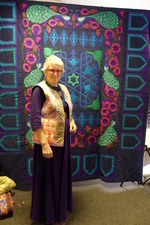 A love of sewing and making with her mother and grandmother continues the tradition. Organic cotton is produced according to the internationally recognized organic farming standards – grown without the use of harmful pesticides, instead using pheromone traps, crop rotation, hand picking of bugs and natural repellents. Organic fabrics can also be made of bamboo, hemp nettles and silk. Cotton fabric is woven into all of our lives. We wear it, sleep under it and craft beautiful things with it, yet how much do we actually think about where it has come from? Where was the cotton grown, by whom, what chemicals have been added along the way? They also sell locally sourced buttons, lovely lace and kits for making knickers. During the lunch break we were invited to go into the main Westpoint exhibition centre where an antiques fair was taking place. The afternoon started with presentation of the silver thimble to the winner of the Audrey Dean award for first quilt won by May Hows. Our afternoon speaker Mary Gamester’s talk was on 65 years of sewing. She told us that she started at her mother’s knee and disliked sewing at school but took art and embroidery courses for her teacher training. During her career as an Infant Teacher and locally as Head Teacher she persuaded the school to allow her a break to India which she found very inspiring. Following retirement she enrolled for patchwork City & Guilds, certificate and diploma, closely followed by machine embroidery at Missenden Abbey. Lately she has designed and made wall hangings inspired by architecture, poetry and visits to gardens and has been developing transfer paint techniques which are then quilted and embroidered.